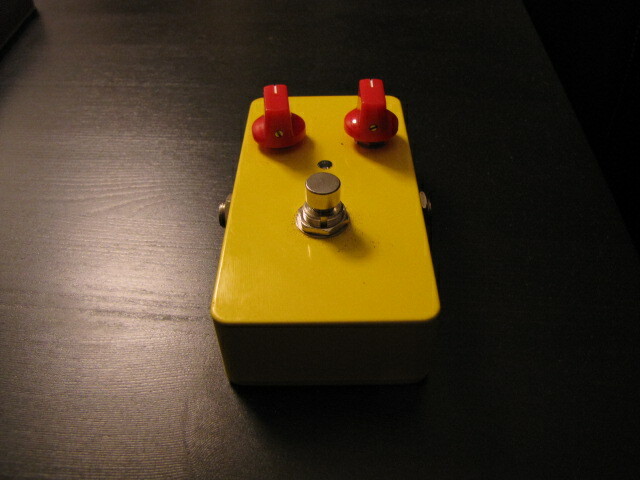 This is my twist on the Orange Squeezer compressor. I use an h11M1F optofet instead of a JFET as a current controlled resistor (not voltage controlled). The signal chain is discrete FET and the control signal is generated from a ZETEX ZXCT1041 current sensor – used for battery chargers. It is configured to act as a full wave precision rectifier. Unlike the Orange Squeezer you can adjust level and compression – it has all sorts of potential for mods. The ZXCT1041 can be replace by an opamp such as the one I use for the peak detector, configured as a precision full wave diode(see op amp data sheet) – not much difference either way. I have noticed that at very low compression settings with high guitar input levels(>.5Volts) there can be some distortion. The Opto FET I am using appears to have distortion that looks like crossover distortion with signals greater than 200mV. When compressing the signal across the OPTO FET decreases so that normally eliminates this issue but at low settings – this may be a problem. I am going to explore just using a linearized JFET in its place and or other solutions. By applying shunt shunt feedback from the Drain to the Gate of the first JFET stage of my compressor, I reduce VDS across the optofet by a factor of 5! So with a input of 1 volt, the the VDS of the optofet is about 200mV worst case. Now it performs beautifully. The feedback consists of a 470k ohm resistor in series with a .1uF cap from drain to gate. Now the source must be bypassed with a 10uF cap – where before it was optional. The gain of the stage with this feedback is now about 4. What happens is that the feedback subtracts from the input at the optofet drain node greatly reducing the VDS across the voltage controlled resistor – while still providing gain.